Adrienne and Kyle were married at the beautiful Marigny Opera House. And oh my goodness! Can we just talk about how cute they are? With photography by Arte De Vie and floral design by Kim Starr Wise Floral Events, just one look and I think you will see that this day was filled with love and all the good stuff that beautiful weddings are made of. From the photographer, "While Adrienne was getting all dolled up, her mom worked meticulously on some last minute touches of her veil. Once Adrienne slipped into her dress, (which by the way was simply stunning), we did a few bridal shots of her before loading up the limo and heading over to meet her groom at the Opera House! Their first look was such a sweet one. And their ceremony? I can't tell you how beautiful it all turned out. With one of the most touching parts coming from a song performance on the piano by one their closest friends, there wasn't a dry eye in the house when Adrienne and Kyle said "I do!" More from the photographer, "Once the vows were exchanged, it was time to kick off the party in true New Orleans fashion with a table of champagne and a brass brand leading a 2nd Line parade through the Marigny! That was the beginning of what was to a great night of dancing at La Louisiane in the French Quarter with the incredible band The Phunky Monkeys. "Their reception included His & Her’s Signature cocktails, reminders to "let them eat cake," and a dance party that didn't stop! The rest of the night was a great party and concluded with the happy couple running through a shower of ribbon confetti as their friends and family saw them off in a horse-drawn carriage. It was a wonderful wedding celebration." 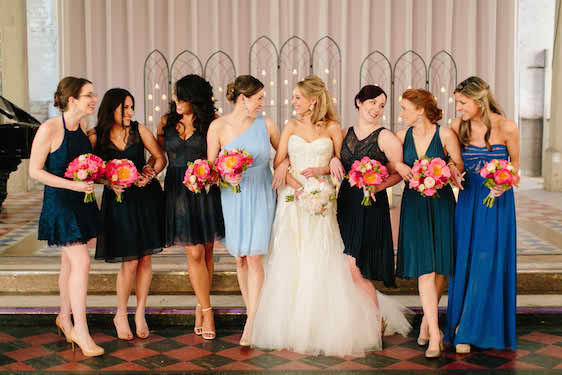 2 Comments " A Classic New Orleans Wedding With Sophisticated Details "
So much gorgeousness! Love the flowers especially! Love this. Her gown is stunning!